"Phlebotomists draw blood for tests, transfusions, research, or blood donations. Some explain their work to patients and provide assistance when patients have adverse reactions after their blood is drawn," according to the Bureau of Labor Statistics. Phlebotomists primarily draw blood, which is then used for different kinds of medical laboratory testing. In medical and diagnostic laboratories, patient interaction is sometimes only with the phlebotomist. 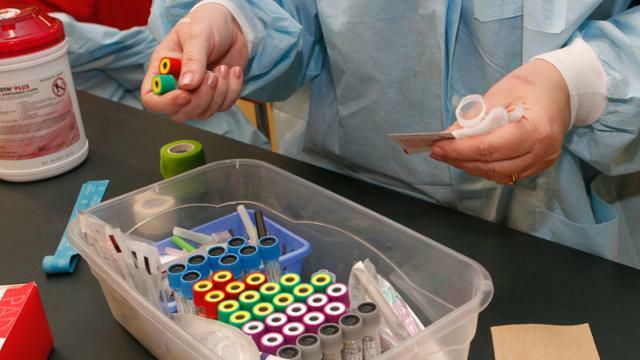 Because all blood samples look the same, phlebotomists must carefully identify and label the sample they have drawn and enter it into a database. Some phlebotomists draw blood for other purposes, such as at blood drives where people donate blood. In order to avoid causing infection or other complications, phlebotomists must keep their work area and instruments clean and sanitary." What do Phlebotomy Technicians earn in KC? The mean wage is $35,440 per year, or $17.04 hourly, according to the Bureau of Labor Statistics. How do I become a Phlebotomy Technician? JCCC's program can be complete in approximately 4 months with 150 hours including 100-hour externship experience.